Acquiring the best bathroom scale is an indispensable need for all interested in keeping a good shape. Staying fit means to put up effort and effort can only be maintained by constant motivation. Yet, keeping close track of your achievements by frequent measurement of your weight is the sole way to encourage yourself to hold onto whatever diet or exercise program you are on. This is where the scale enters the game. There are many types of scales ranging from simple ones for basic weight reading to very advanced models with several functions, To help you find the scale you need, I have selected some of the best digital bathroom scales in the market for you and tried to impartially show their advantages and disadvantages. It is up to you to choose scale best suiting your preferences. Accuracy: When talking about bathroom scales, good basically translates into accurate and the best means the most accurate. That said, accuracy is slippery concept and the only sure way to find out about it before buying the scale, is to read all the customer reviews. The good news is that I have already done that time-consuming reading job for you and made assessments on the accuracy of different models. User-Friendliness: A scale that is easy to switch on and displays your weight in a clear way, preferably with backlight and has long-lasting batteries will make life easier for you. 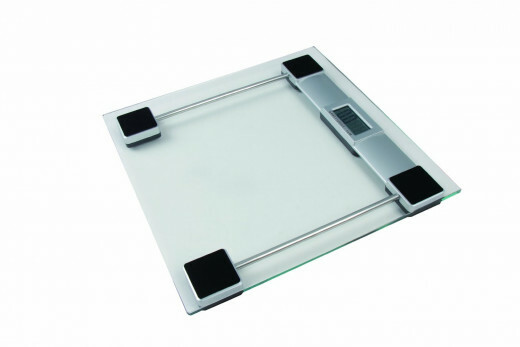 Durability: The fact that bathroom scales are quite affordable does not have to mean they are expendable. If customer reviews point out to a consistent pattern of untimely breakdown, you should consider another scale. User Recognition: Some of the better bathroom scales in the market come with the ability to record and keep track of your past weight measurement. They can recognize you based on your body weight and display relevant data. This no a must-have but certainly a nice touch. Body Composition Analysis: The scales with this function are named body fat scales and are equipped with electrodes to scan your person and tell you the amount of muscle and fat that make up the bulk of your body. They can be pricey but the EatSmart Precision GetFit, reviewed down the page as the best bathroom scale, offers that function at a competitive price. If interested in more body fat scale reviews, ı have a separate article that focuses on best body fat scales. This is a very economical scale and its price appears to be the main reason for its popularity. Customers happy with this product stress that they got a bargain. However, not so happy customers complain about faltering accuracy and inconsistent readings. This is something you should expect from such a cheap scale but not to the degree to call this scale a bad one. It has a 22 mm lcd screen for display and maximum weight of 330 lbs. Both of these features are OK. 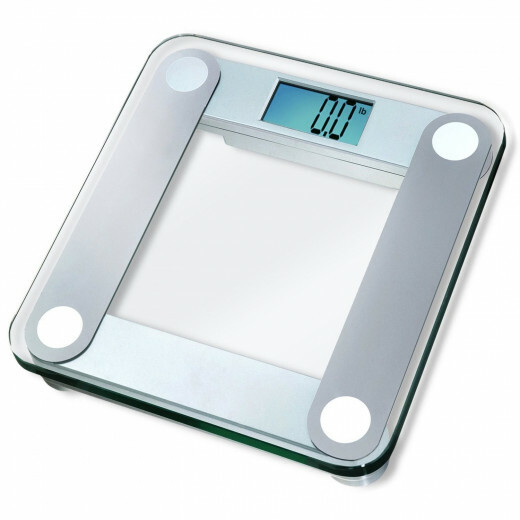 In short, Think Tank Technology KC90107 KCO Group Personal Glass Scale offers mediocre features for a low price. If you are not interested in allocating much money for fitness, this may be the one for you. But my advice would be to pay a few dollars more to enjoy one of the better scales below that will serve you well in the long term. One last good point: the scale is actually beautifully designed. It looks much nicer in reality than it looks in the photo. Ozeri is a decent supplier of digital housewares stuff, whose products such as tower fans are rated really well by customers. The scale seen here is an option for those who want to want a cut-price scale without compromising the barnd name, although you should not be excepting a level of quality that can be compared to the EatSmart scales. 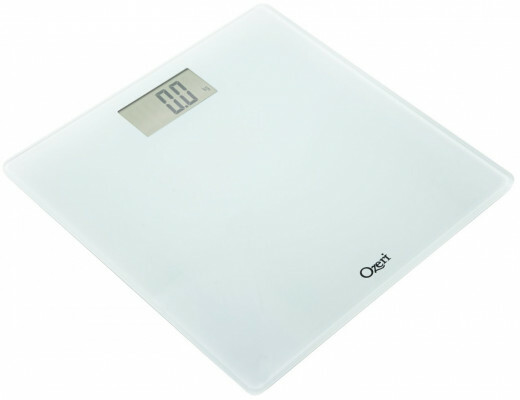 The features of Ozeri Precision Digital Bathroom Scale are pretty standard. It weighs up to 400 lbs with 0.2 lbs intervals. You can change it to kg with a button and it turns off automatically when left idle. The digital display screen does not look spectacular and there is no backlight. It runs on one small lithium ion battery, which is a little harder to find at the local store than the regular AAA batteries but that should not be a big concern. The cutomer reviews for the Ozeri scale are fine although there is a considerable number of people who seem not to have enjoyed the scaling experience. One major complaint is the lack of precision. It looks like the Ozeri scale is sensitive to the slightest shake because many people have reported getting different results from measurements with a few minutes intervals. There are also issues with the unit's durability as many customers state it was dead on arrival or stopped working after a while. I have reason to believe that the battery that comes with the scale is no good and that's the reason behind some of the complaints. And some scales come with no battery at all. In conclusion, I believe Ozeri is a better choice than the cheapest Think Tank but it should not be seen as a bargain. Instead, it is justified to say that you get what you pay for. EatSmart Precision Digital Bathroom Scale is the bestseller of bathroom scale market and receives excellent reviews by customers. The popularity of EatSmart's scale is simply because it is able to offer the optimum price performance ratio. 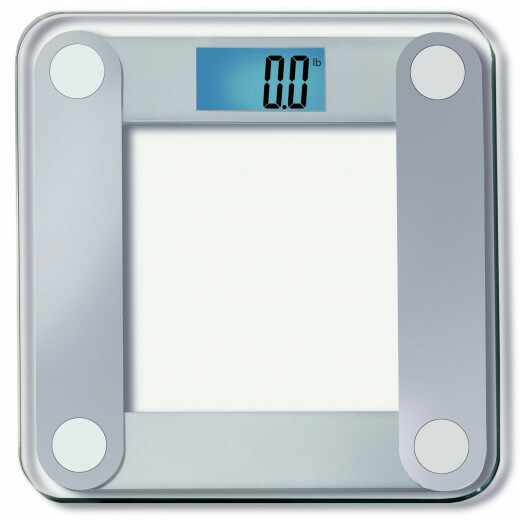 This product perfectly satisfies all the basic features that one should look for in a digital bathroom scale and does it for a very low -though not the lowest- cost. 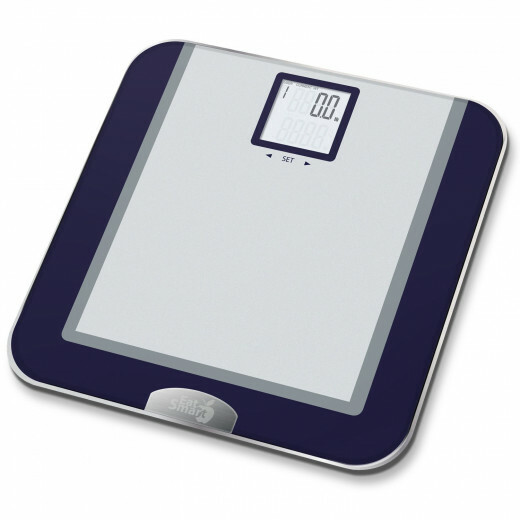 The edge of EatSmart Precision Digital Bathroom Scale is its reputation as the most accurate bathroom scale that can be found at this price level. Measuring up to 400 lbs in increments of 0.2 lbs, this simple but smart scale gets thumbs-up from customers with its consistent readings. Unlike the occasional variations that cannot be avoided in most scales, even two separately purchased EatSmarts are reported to be consistent. It is also very easy to turn on this scale. No need to hit or shake the scale. Just step on it and get your weight. Another simple but great feature of EatSmart Precision Digital Bathroom Scale that makes it stand out is the nice 3.5'' lcd display screen. The display is pretty large and clear and the backlight makes it easy to read in the dark. Finally, with EatSmart you do not have to worry about any problems you might have with the scale you buy for reportedly the customer support service is more than willing to help you out and even offer to replace your scale if you are not pleased with its performance. Customer-friendliness is enough reason to choose EatSmart. All in all, EatSmart Precision Digital Bathroom Scale is the best choice for people who simply want an accurate and practical tool to measure body weight. If you want a functional, good-looking and wallet-friendly scale go for EatSmart Precision Digital Bathroom Scale. Bigger is better. Eatsmart Precision Plus Digital Bathroom Scale with Ultra Wide Platform offers you everything its sister scale does plus a little bit more. The main difference is the wider platform, 16 inches compared to the 12 inches width of the above scale. Secondly, this one will scale up to 200 kg compared the 180 kg capacity of the above one. 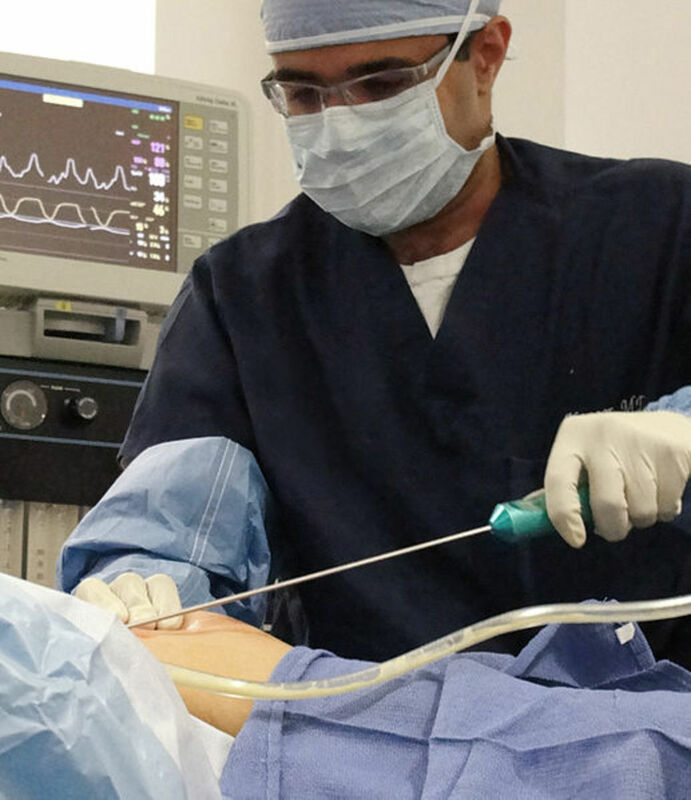 The point about Precision Plus is basicly that it gives you some more freedom and costs a little more. Both sell very well so the decision is yours. 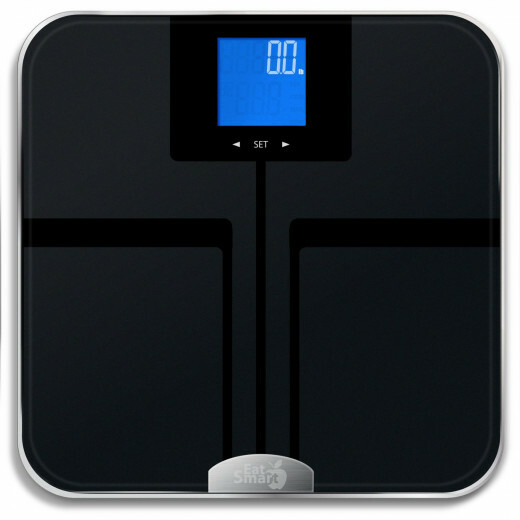 This is technically the best digital bathroom scale that does not have body fat monitoring function. That being said, based on your specific needs, it may not necessarily be the best choice for a scale. It has all the high-quality features found in EatSmart scales. What makes it special is the user tracking ability. EatSmart Precision Tracker automatically recognizes up to 8 users based on past weight data and displays the past records for you so you can keep track of your progress better. 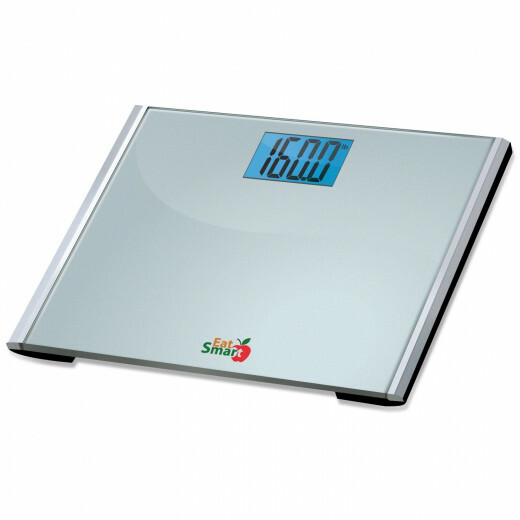 The white lcd display screen is 3,5 inches as in all EatSmart scales. But the need to display past records means that the actual data display size is smaller than EatSmart Precision and Precision Plus. If large display of numbers is important for you and you do not need the tracking function, the lesser EatSmart models may offer a more optimized solution. On the other hand, Precision Tracker is best if you do not mind a smaller display and for example, you have a family where the user tracking ability will be of use. There is another reason EatSmart Precision Tracker Digital Bathroom Scale does not get the recommended badge that it should have got for the digital bathroom scales: There is a similar scale, from EatSmart again, that has more features and costs only a few bucks more. Indeed, EatSmart Precision GetFit seen below has everything Precision Tracker has to offer plus body composition monitoring ability. The Precision Tracker is still a great choice but remember there is a better model for nearly the same cost. EatSmart Precision GetFit Digital Body Fat Scale is another great product of EatSmart brand. It is a body composition scanner that brings together Eatsmart quality, good pricing and extra features that go beyond an ordinary scale. The brand sells some of the most popular scales in the market as listed above and this scale boasts the same features of accurate reading and easy use as well as the guarantee of friendly customer support. Plus, the Body Fat Scale is equipped with Electrical Impedance Technology to calculate the percentage of fat. 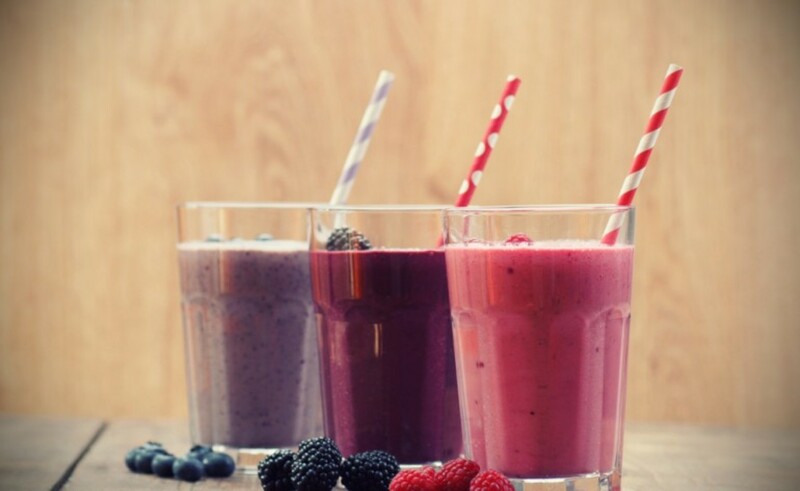 muscle and water in your body. EatSmart's product is also capable of storing data for up to 8 people and recognize its users once they step onto the scale. Thus, basicly satisfying the needs of those who are a bit more into the fitness business than the rest, the scale at hand offers these great features for a price that is somewhat higher than the cost of a simple scale but definitely less than many body composition monitors in the market. With such great price-performance ratio, EatSmart Precision GetFit Digital Body Fat Scale caters not only to professional sportsmen but also to all who are trying to burn some fat and build some muscle and would spend some extra penny to be able to better monitor the gains and get a taste of using an advanced scale. A kitchen scale will do much better in measuring the quantities demanded by your recipe book than the traditional units such as the spoon. An important step in your quest for the muscular body is to find and acquire the best dumbbells for your workouts. This is a review of the best adjustable dumbbells available for puschase.